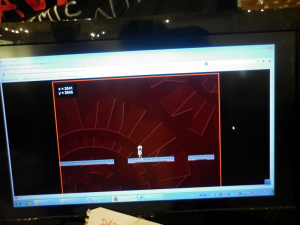 Playable demo for Level 2, where you play as Tilda. Even the army wants to fight Floreal. 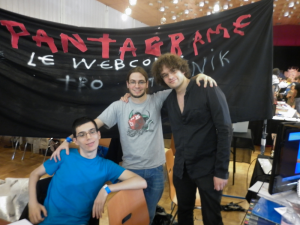 Left to right: Alex (programmer and co-game designer), Pierre (webmaster) and me (the visual artist and writer). All of the Pantagrame teammates are amongst my best friends, and it was GREAT to have both Alex and Pierre with me for the trip. 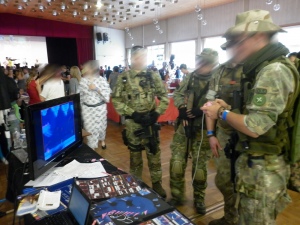 Also we got help and support from a lot of persons in Strasbourg. 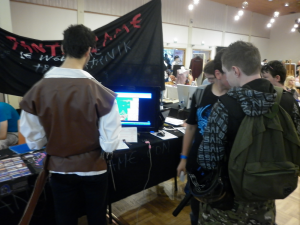 Thanks to Kanar, Aurélie, Flo, Gabrielle, thanks to the JA organizers who were very nice and attentive to our needs, thanks too to all the people who visited our booth! It was a great time and we can’t wait to be back!